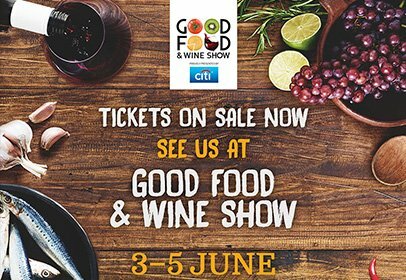 Enjoy a fun day out with friends at the Good Food & Wine Show 3-5 June discovering new ideas, products, tips and hints to inspire your next foodie adventure. There’s so much included with your ticket! Watch culinary stars such as Colin Fassnidge, Matt Moran and Miguel Maestre cook live on stage in the Good Food Theatre, picking up hints and tips to recreate their dishes at home; and participate in wine appreciation sessions at the Cellar Door; Meander down Tucker’s Natural Cheese Alley, find a new favourite beer in Brewers Lane, enjoy dining at the Grazing Garden, go behind the labels of boutique producers in Artisan Square, take a seat at Maggie Beer’s Kitchen Table. With hundreds of local and international exhibitors in one place, your new favourite food and drinks are only a sample away. Start planning your adventure at Good Food & Wine Show website. Save 20% on general admission tickets booked online by using code word EXHIBITM! Come and visit our staff at Stand #J13 about our classic culinary programs in Cuisine or Patisserie, and our Bachelor and Master degrees. An assortment of Le Cordon Bleu-branded culinary arts products will be available for sale, including our famous Cook’s Bible and Chocolate Bible cookery books of classic Le Cordon Bleu recipes. Visitors will go into a draw to win a culinary products hamper valued at over $300 for each day of the Show.